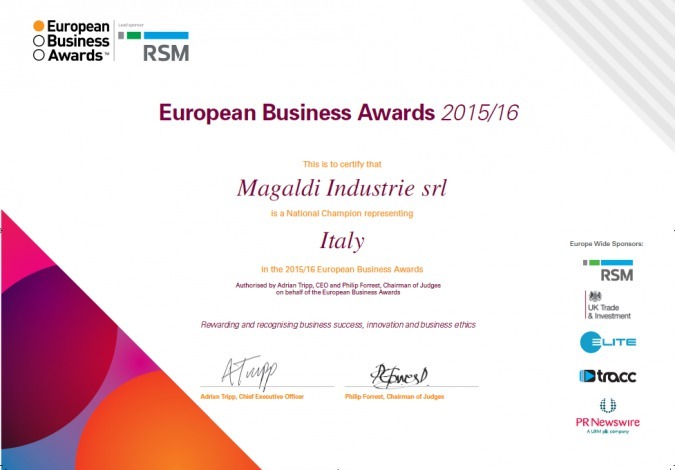 Magaldi has already been named as one of the National Champions in this year’s European Business Awards but the challenge has not come to the end yet: we are currently competing against all other country National Champions for the public vote! We realized a short video in order to give a powerful insight into the story of our business and success and to share our values based on the development of innovative and dependable solutions aimed at the Customer satisfaction, the respect of the most severe environmental regulations and the total safety for operators. The video has been published on the EBA website and it’s available at http://www.businessawardseurope.com/vote/detail-new/the-business-of-the-year-award-with-turnover-of-26-150/16944. You’ll be able to vote until 26th February 2016. The company receiving the most votes will be named ‘National Public Champion’ for Italy on 7th March 2016. We are hoping that the public will watch our video and vote for us since the public vote means a great deal as it is both our existing and potential Customers and Clients giving their approval to our success. So we ask you to take some time, watch our video, and cast your vote!